Circled in this deep image are four extremely compact and bright galaxies so distant they are seen as they existed just 500 million years after the big bang. They are much more luminous than anything previously seen at such an early epoch. 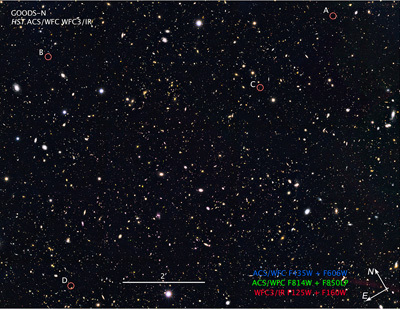 The image above is a portion of a deep sky Hubble Space Telescope survey called GOODS North (Great Observatories Origins Deep Survey) that contains the well-known Hubble Deep Field (HDF). 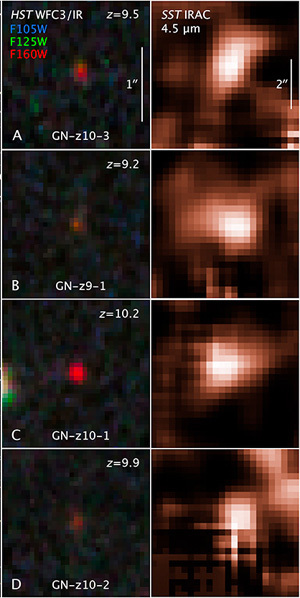 Below are images of each object from the Hubble Space Telescope (left) and the Spitzer Space Telescope (right). Credit: NASA, ESA, G. Illingworth (University of California, Santa Cruz), P. Oesch (University of California, Santa Cruz; Yale University), R. Bouwens and I. Labbé (Leiden University), and the Science Team.